It's time for the Verve Divas to bring you our monthly Diva Inspirations Challenge and Blog Hop! There are two ways to win Verve prizes: comment on the design team's blog hop posts (linked below) to see their take on the inspiration, then go get inky and link up your take on the challenge to be eligible in our prize drawings! You have until April 5 to link up, so feel free to play as often as you like. After a few month of winter, nothing soothes the soul like a burst of vibrant color. This boho kids bedroom does that and more! Feel free to take your inspiration from the photo or the color combo, whatever suits your fancy! We can't wait to see what you create. Challenge deadline: Tuesday, April 5. This month I met a very special lady who inspired me with her honesty, integrity and desire to change her life. 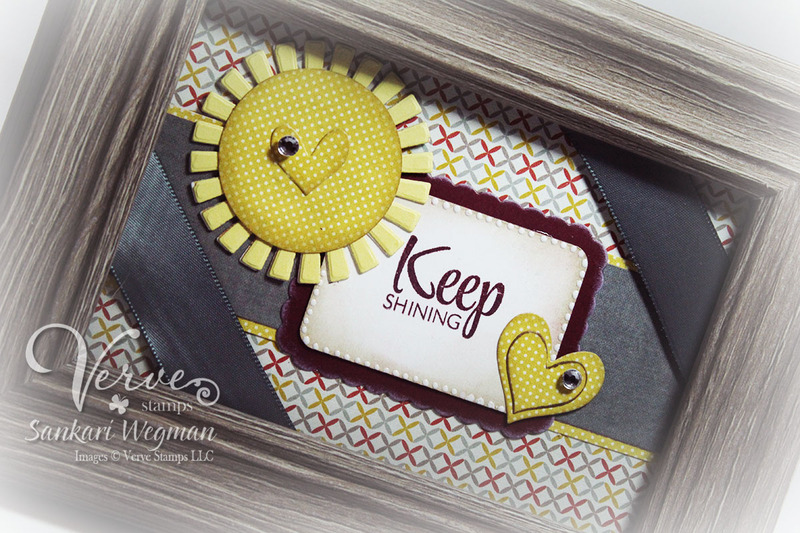 Being with her was an honor and I wanted to make a special gift for her - so I created a framed piece for her using the inspiring newly released Rise Above stamp set and the Partly Cloudy die set. I didn't follow the color scheme exactly above - just saw sunshine and couldn't wait to use it! I love this sentiment and the coordinating dies!! I stamped the sentiment and cut it out with the Rounded Rectangular die and matted it with the Rounded Scallop Frame, I added the Heart Quartet dies to the center of the sun and to the side of the scalloped frame :) I finished it off with some bling to the hearts and some gray stain ribbon to either side of the card :) I can't wait to give this to her tomorrow! Your framed art is wonderful. How special that you have encountered someone who is a blessing to you and who inspires yo to create! So pretty and such thoughtful gift! OH MY GOODNESS..... I absolutely love this!!!! What a beautiful piece!!! What a beautiful and thoughtful gift. Love it. That is a lovely gift for your friend to remember your time together. The sketch or colours are for you to take what you like from and this is just lovely. 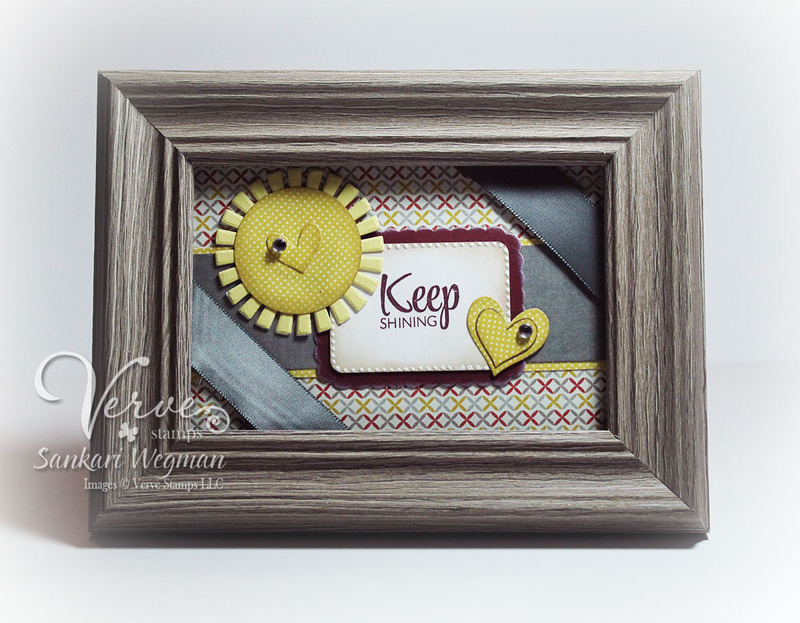 I Love the idea of making something and framing it and these stamps work really well for that! A very lovely creation and a very thoughtful gift! Pretty gift! Love the sun die! Great creative idea. Thanks for the inspiration. Very cute card! Love the pretty colors! What a special creation to keep her encouraged! I love your color combination and the dotty sun. Beautiful decorated frame and a great reminder to see every day! OMGosh what a sweet gift. She will LOVE it. Thanks for sharing. Oh my, what a gorgeous piece of art. I love the hearts and the DP you used for them. Your circle/sun/heart combo is beautiful. I know this will be treasured by the special lady who will receive it. Beautiful project love the colors. I absolutely ove this! It spoke to me this morning! I love the sun it is so different than most. Great post! Beautiful!! Love the patterns you used; I know your new friend will love this! What a lovely gift for your friend. Lovely project! perfect gift ! Cards are great but so are projects like this. I just got this set and I'm looking forward to using it!